Jonathan Blow's creative, temporal platformer has at last made it through the timestream to the PlayStation Network. Most people have either already played Braid, or determined that they have no desire to because they despise its creator, Jonathan Blow. For the rest of the population, the game has now hit the PlayStation Network for the price of $14.99. 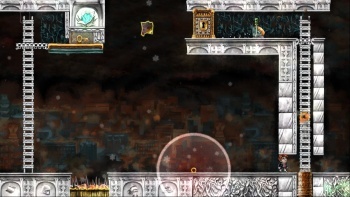 Braid is a side-scrolling platformer where the player has control over various aspects of time. Each level is basically a puzzle that must be solved, with new time-controlling abilities constantly introduced throughout the game. The main character is a regular guy, but has at one time been described as "Mario from the future." Though many thought Braid was overpriced when it was first released on Xbox Live Arcade well over a year ago, $14.99 doesn't seem like such a big deal now. I know it gave me a good 5-6 hours of gameplay, which is acceptable because the variety of gameplay made its entirety compelling. When we pay $4 for a comic book that lasts 10 minutes, or $12 for a 1.5 hour-long movie, I have no problem supporting a developer that made a really cool 6 hour experience I enjoyed for $15. If you like "indie" style games, and for some reason haven't played Braid yet, it's a safe bet. The time-controlling mechanics may seem like a gimmick, but they're done in a smart way, tasking players to do more than just fast-forward and reverse.